The track-sides illustrated how weeds and non-local species become established through the passage of feet, paws, wheels and wind. Quite newly-germinated Fleabane* [Conyza bonariensis] plants would produce hundreds of parachuting; dandelion-like seeds were they left to grow and ripen. Similarly Prickly lettuce* [Lactua serriola] plants have seeds which are readily blown away on the breeze. Their leaves "tend to orient in one plane, hence the name Compass plant". The young leaves are edible and high in Vitamin A. "The earliest grown lettuces bore close resemblance to this weed, as shown by 6500-year-old Egyptian wall paintings". There are several native cudweed species and introduced types. I'm not sure why but I quite like the form of Euchiton collinus and E. sphaericus. Even though they are weedy they also show great tenacity in thriving in harsh, gravelly conditions at the edges of tracks and roadsides. Yellow Hawkweed* [Tolpis umbellata] first appeared at the edge of the unexplained strip where, in November, we stopped to admire the tiny Common sunray, Triptilodiscus pygmaeus. The Sunrays have been numerous in some damper, clayey, sunny areas this spring whereas the Hawkweed is more of an opportunist. We climbed up the winding track behind the houses, pondering the increase in Capeweed* [Arctotheca calendula] numbers since the track was graded. Drainage cuts were made beside the main track and Capeweed flourished along these cuts. In this same area Slender pigeon grass* [Setaria parvifolia] increased last summer and a new introduced species French catch-fly* [Silene gallica] germinated following this spring's rain patterns. Were the seeds already in the soil to be stimulated by excavation or did the machinery bring these species into the reserve? There has been some brush-cutting behind 3 or 4 of the houses. The height of grasses has been reduced but Dianellas and native shrubs have also been beheaded. Curved rice-flower [Pimelea curviflora] has escaped this damage and shows delicate pale orange flowers. Even closer to the ground Ivy Goodenia [Goodenia hederaceae] is the current star of the leaf-litter as the lemon-yellow flowers are fresh and new when other species have finished their display at the onset of summer. The pea-flowered shrubs we found in November show their green pods which will ripen in the heat and eject the seeds. Patches of Common everlasting, Chrysocephalum apiculatum, bring splashes of deeper yellow only matched by Clustered everlasting [C. semipapposum] flowering on longer stems in half-metre high clumps. In The Pinnacle the latter tend to be more common in the woodland whereas the Common everlasting excels in grasslands or open spaces in the forest. Is the Climbing saltbush [Einadia nutans] a problem-solving plant? They have utilised the niche provided by the trunks of trees. In this position they can take advantage of any rain that runs down the trunks and avoid the umbrella-effect of the trees' canopies. Already there were a few tiny red berries to be seen amongst the ground-cover's leaves. Perhaps Crested pigeons feed on them or can we imagine possums might stop to feed there on emerging at dusk? Hare's foot clover* [Trifolium arvense] has germinated in thousands giving a pinkish fuzz to the ground amongst grasses and forbs at the edge of the forest. A seemingly larger version of the clover has appeared as if from nowhere. Narrow-leaved clover* [T. angustifolium] has larger, denser, spikey clusters where individual pink flowers appear briefly amongst the cluster's greenness. At first I naively hoped they might be a Ptilotis species but hopes and memories of inland flora were dashed in the pages of the weeds book! Earlier Cats-ear* [Hypochaeris glabra] and Flatweed* [Hypochaeris radicata] were even more numerous. Their dandelion-like flowers wait for the sun's strength before they open daily. They make a spectacular display below knee-height … if only they weren't weeds! We can but hope their millions of seeds are attractive to insects and don't reach the soil as a seed-bank for the next decade. When the soil was damp both these species pulled up easily but there were so many and the heads would need to be removed and bagged by weeders as the flowers continue to open and set seed if attached to the plant or left on the ground. New Holland daisies have tiny pink-purple flowers and fluffy seed-heads which give the common name Fuzz weed. Vittadinia cuneata and V. muelleri seem to specialise in colonising or utilising bare ground. They're useful and attractive small native plants. Proliferous pink* [Petrorhagia nanteuilii] lived up to its common name after the rain and the capsules on knee-high stalks can be seen, browning-off, everywhere. The attractive pink flowers have, until now, been common but not invasive. Will this year be different now that the species' seed bank is set to increase? The increased dampness stimulated Yellow centaury [Sebaea ovata] which was a local I'd not seen before until a visit to Mulligans Flat's grasslands east of Bonner. We found several in damp areas of The Pinnacle in November but they've "vanished" now and only the pink, Common centaury*, Centaurium erythraea, is visibly flowering by December. Now visible as rusty hyacinth-like spikes Lesser Broomrape* [Orobanche minor] is a parasitic plant with almost colourless – pinkish flowers. Obviously their spores spread readily as numbers of these plants have grown in a variety of habitats this spring whereas their presence isn't so obvious in a 'normal' spring. They parasitise a wide range of plants overseas apparently. It was amazing in spring and early summer to also see many onion orchids, Microtis unifolia, camouflaged amongst the grasses. When in flower the tiny orchid blooms are green and arranged up the stem. Some of the stems have grown to knee-height in favourable conditions and they're easier to see now that their flowers, too, are browning off. It's easy to brush against Sheeps' Burr [Acena agnipola] without noticing the prickly fruits on socks, laces and pants fabric at first. The fruits have tiny hooked spikes. Perhaps they're one of the species that were the inspiration for Velcro. Stinking pennywort [Hydrocotyle laxiflora] has been consistently plentiful and is now in fruit showing quite large burr-like balls. No one went down on their knees this time to check the "sewagey" smell that gives Hydrocotyle its name but we obviously were crushing enough leaves to notice the aroma from these ground-hugging plants last month. They thrive in the leaf-litter perhaps drawing nutrients from the litter's slow decay. Twining glycine [Glycine clandestina] with miniature Hardenbergia-like flowers utilises a range of plants to take its stems towards knee-height. When we were pulling St Johns Wort* [Hypericum perforatum] some of the weeds' stems were fulfilling this role. Australian bindweed [Convolvulus erubescens] trails along the ground or uses other plants to bring its pure pink flowers towards the sun. The blooms 'follow' the sun daily and close at night. The plants are great survivors; one of the first species to come back after grassfires. I noticed several plants in the rough grass on a Belconnen town-centre median strip today. They shared the spaces with Variable glycine [Glycine tabacina] which grows in clusters. The stems are about 10cm tall raising the purple flowers where pollinators will see them. There are some of these in the reserve also. The Yellow Autumn lily [Tricoryne elatior] is also sun-conscious. It's easy to overlook the plants on a dull day. It's another species that comes back strongly after fire, having yellow petals. To me the shape of Native St Johns Wort's petals suggests spinning or a slight moving effect. Hypericum gramineum has orange petals and is almost insignificant in comparison to the bold weediness of the introduced, invasive "SJW". In and at the edges of the forest there are numerous Sticky everlasting [Xerochrysum viscosum] one of the many plants whose 'petals' give rise to the paper-daisy name. Cotton fireweed, Senecio quadridentatus, is an excellent, silvery-foliaged coloniser. The yellow daisy flowers never quite open but the seeds disperse dandelion-like from the sometimes 50 cm tall plants. I have Sundew [Drosera peltata] on my list of plants we saw, but only remember the swathe I tried to photograph four weeks ago. If we saw isolated plants they'd be indicating the last trickles of moisture as summer takes hold. I haven't learnt what drying sundews look like. Surprisingly few dried-up Early Nancy [Wormbea dioica] plants were visible after the dense flowering that spring produced. 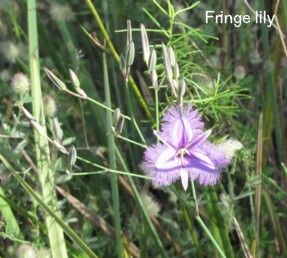 We found a few Fringe lilies [Thysanotis tuberosus] but by 23rd, when we were weeding, they were as obvious and numerous as they'd been in November. Perhaps they respond to air-pressure as much as sunlight and remained closed as though sensing the approaching storm on 18th. The flowers'six deep-pink petals are edged with a delicate fringe. Indigofera have grown back after the hazard-reduction burns in the forest three years ago. There are also many newly germinated specimens of both Indigofera australis and I. adesmiifolia. Any seed pods would be waiting to dry out before their specific structure twists to explode the seeds away from the parent plants as peas and beans would if we didn't eat them. Hickory wattles, Acacia implexa, stood out with lush almost sickle shaped 'leaves'. Literally one of two Saffron thistles* [Carthamus lanatus] were dealt with as we carried a pair of gloves & scissors with us for such occasions. The prickly species is in plague-proportions in The Pinnacle's grassy areas. FOTPIN volunteers were brush-cutting them as we walked, needing to cut down the plants before the seeds are able to set and ripen. Passers-by reported seeing the 'thistle', Salsify* [Tagopogon porrifolius], another member of the Asteraceae (daisy-family). The seed-heads are magnificent and nearly the same size as a tennis ball. Dispersal would be effective on any breeze. Its flowers are pinky-purple but the related Goats-beard*, Tragopogon dubius, has yellow flowers. Apparently Salsify's taproots can be eaten as though they were parsnips. The venerable Hairy Appleberry, Billardiera scandens, had mostly green fruits already. They will turn bluey-purple when closer to ripeness. There were a few pale-greenish, almost Correa-like flowers still awaiting pollination amongst the foliage. 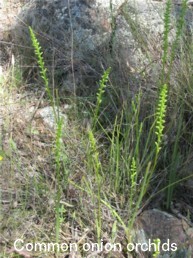 This species is more common in Aranda Bushland and The Pinnacle hosts more younger plants in the forest … perhaps they were palatable to stock with only one surviving grazing from that era, relatively near the houses. We had a bag with us for collecting pulled Paterson's curse* [Echium plantagineum] plants as the older flowers have produced small black seeds just waiting to be knocked onto the ground to re-stock the weeds' seed bank. As we left the lower end of the forest track the PC was much denser showing a need for a concerted PC effort against this highly-invasive weed. Like so many problem plants it was reputed to have been encouraged because it appealed to someone as a garden plant. Its colours are attractive but the plants contain alkaloids which damage the livers of long-lived stock. The racket of thousands of Cicada calls tends to drown out other noises in the forest on hot days. With the soil damper than for several years the Cicadas have obviously been stimulated into action after many years under the leaf-litter. Sometimes the shed "skins" of cicadas can be found clinging, beigey-brown and almost ghost-like to the stems of plants. Almost since the fading of winter both the suburbs and the bush have been graced by a flurry of countless butterflies. Their emergence from pupae has been triggered by the rainfall patterns and maybe some species may have rapidly completed second lifecycles to take advantage of the conditions. Common browns, Heteronympha merope, seem to have been present throughout but other species seem to follow a subtle emergence timetable that my head has only partially absorbed at this stage. Some butterflies, like the Common grass blue [Zizina labradus], may have almost muted colours until one's able to study them with a hand lens or examine a dead one. Then the delicacy of the colours and patterns is revealed. Many moths, too, have amazing patterns and texture-effects but we're not always able to ignore our quest for colour and brightness when appreciating their gentler hues. Several birds were heard rather than seen clearly by everyone. The list (see below) included Kookaburra, Raven, Leaden flycatcher, Blackbird* and Noisy Friarbirds. I recently came across a Friarbird nest and, nearby, that of an Oriole alongside Ginninderra Creek. It wasn't until I consulted books that I appreciated how clever their nests' construction is. They're suspended cups hung from a close pair of slender, outer branches and include the birds using spider-threads to bind bark and grasses together. Rainbow lorikeets aren't native to our region but they're often heard and seen at and over the western end of The Pinnacle. It's thought that a small number were once aviary birds, perhaps a decade ago, and their numbers have built up. Whilst there's no doubting the appeal of their colours we might ask whether we can "afford" to host another hollow-nesting species when there's already a scarcity of suitable trees for existing native species. In other places newly colonised by the Rainbow lorikeets their numbers and assertiveness have caused problems. John Brannan showed us a presumably-deserted Grey fantail's nest complete with abandoned egg. The exquisite nest with its long 'tail' is shaped like a wine-glass. Soft bark is bound together with spider-web ….. and we think we're so adept at crafting things with our hands! There are several Willie wagtail territories even along the forest edges. The Dungowan eucalypt hosts one and I wondered if these insectivorous birds were responsible for the litter of butterfly wings by the horizontal bars of the cavaletti. A White throated tree-creeper was checking the bark of trees near us for insects. The newly-declared Kama nature reserve provides habitat for the endangered Brown tree-creeper a species which thrives in woody grasslands where there is also fallen timber. Some pairs have been reintroduced, from NSW, into Mulligans Flat Sanctuary now that it has a vermin-proof fence and re-introduced fallen timber. Dusky Woodswallows come to the ACT region during summer and some nest in The Pinnacle's hollow trees. They hawk insects on the wing and are a joy to watch. Both Starlings* and Common mynas* are introduced species present in the reserve or in the farmland's paddocks and trees. Adult starlings have an attractive sheen on their feathers in sunlight and when wheeling in a flock-of-hundreds they're quite a sight. But, less positively, the related species readily take over nest spaces from native birds. The nestboxes strapped to selected Pinnacle trees were installed to see which native species would use them and whether Mynas would then destroy their efforts. The nestboxes are checked regularly as part of an ANU student's PhD studying the effects of the Common myna. It seems nest-box use has slowed this year except for those which have been taken over by Honeybees [Apis mellifera*]. Perhaps we shouldn't begrudge the introduced bees these homes as they are threatened in some countries and the pollination services they provide are essential to production of much of our food. Honeybees were introduced to Australia from Europe in the 1820's. By now it's known that they, and European wasps, can significantly alter the balance of pollination for native wildflowers and the natural order of other native insects and native bee species. 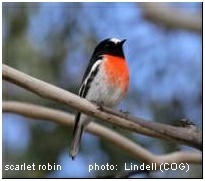 We were delighted to see several Scarlet robins within the forest, but from the track. Presumably they were part of a family. They breed here and it's sobering to hear that there is a decline in the numbers of even such an iconic and 'un-shy', woodland bird as the Scarlet robin. Habitat loss or alteration is the cause. There were fleeting views of Choughs and several nests are known to our regular bird watchers. These birds are essential leaf-litter-turners as they forage for invertebrates on the forest floor. And wrens twittered their presence. Three other species 'of concern' have been seen where we walked but were not present on the day. The Diamond firetail needs grassy understorey in open forest so the southern area of the Stringybark forest serves the species well as there's open farmland nearby. The Speckled Warbler feeds and nests on the ground needing a mix of shrubs or low trees and sparse or low grasses. In contrast the Varied sittella gleans insects from trees' bark but is adapted to working down from the top of branches and trunks whilst feeding. Like the Scarlet robins these three species aren't particularly wary of humans but it's still a special experience to be able to see or observe them. Magpie larks have nested in The Dungowan tree several times. Their calls and those of magpies echoed from there and from deeper into the Kama property. Black faced cuckoo shrikes use this tree consistently also but their nesting attempts aren't always successful. The Frogmouth's nest is visible above the carpark's gravel area, if you know where to foil their camouflage. I wished I'd had a different camera to do justice to the almost navy-blue storm clouds that were gathering over Stromlo and the Brindabellas. Flying, ever erratically, above the sunlit Kama paddocks with the clouds as a backdrop, Galahs and Sulphur crested cockatoos never cease to amuse and amaze. Large raindrops began to fall as we approached the cavaletti and we parted without the luxury of a final chat or de-brief!